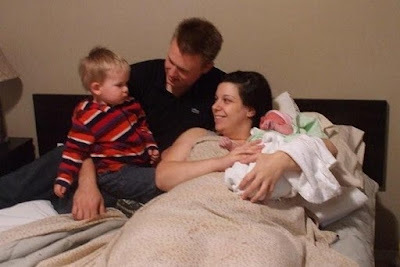 I love this birth story because it is from a 'normal' mama who chose home birth after a long and hard hospital induction. Healing birth is a beautiful thing, isn't it?! Also, really amazing what a great birth partner her own mother was for her and how birth can be beautiful even if not quite what we had planned in our head. Enjoy! I’m not quite sure of the exact moment that we decided to pursue a homebirth. I’m the farthest thing from the ‘hippie-type” I had always imagined gave birth at home. We did have a midwife for the birth of our first child (my son, Merrick) back in 2008, but we hadn’t even considered anything other than hospital birth. I think it was somewhere in between the downward spiral of induction via artificial rupture and Pitocin and the three days my son ended up spending in the NICU due to side effects from the epidural that our decision found its roots. By the time Merrick turned 15 months and we found out we were expecting baby number 2 – we were pretty much sold on the idea of homebirth. After attending an information night put on by our midwives we were hooked. The following is the story of how Keara’s homebirth came to be. I’d been having contractions from 38 weeks off and on, so it surprised a lot of people when my due date (June 28th) came and went with no baby. I, on the other hand, was not expecting to have her before since I went to 41 + 5 with my older son before having to be induced (artificial rupture, pitocin, epidural – the whole gamut). I went for my 40 week appointment at my midwife and she offered to check me to see how my cervix was progressing. She found me to be ‘soft and favourable’ and approximately 2cm dilated. I knew from hearing other people’s stories that you could be as much as 3cm dilated for weeks before giving birth, so I didn’t hold out too much hope for imminent delivery. I may have mentioned offhand that I wouldn’t be opposed to a membrane sweep, and although standard practice at our midwife’s office is to not do sweeps until after 41 weeks, my midwife may have obliged my request . Again, I had previously had about 4 sweeps when pregnant with my son, with absolutely no success, so I was not holding out hope. That night we went for dinner and I experienced some cramping (typical after a sweep), but no spotting or show. The next day I lost part of my plug – just a bit of brown-tinged mucus. On Thursday July 1st I woke up around 6 am with some minor cramping and went to the bathroom – where I noticed that I’d lost a bit more of my plug – this time redder and a bit larger. I went back to bed not thinking much of it. Around 7 I woke back up with some stronger cramping and realized that the cramping had a regular 15 – 20 minute pattern. I texted my hubby (who had decided to go into work on the Canada Day holiday) that “Today may be the day”. Of course with two weeks of prior contractions, neither of us was sure. We agreed that if the cramping got more intense or closer together that I would text him to come home. By 11am the contractions were about 10 minutes apart and starting to get more painful, although still nothing that I would consider actual ‘labour’. Merrick had just woken up, so I texted my mom and she agreed to come over around noon (“No rush” I texted her – nothing would be happening anytime soon). Around the same time my mom thought that it may be time for Billy to head home, so I texted him as well. After Billy and my mom arrived things continued right along. We timed contractions and they were consistently between 8 and 10 minutes, but only lasting about 30 seconds (which just didn’t seem long or intense enough to me to be ‘real labour’). I called our doula Tracy and she arrived at the house around 4 o’clock. My mom had called my dad in the mean time, since contractions had picked up slightly and the intensity seemed to be worrying Merrick. Dad was my back up plan for him if he wasn’t reacting well to me in labour – so off to grandpa’s house he went. At that time, I had spoken to our midwife on the phone and she decided she would head over as well. Tracy had brought veggie lasagna and some muffins and bagels with her – and she put the lasagna in the oven while I laboured through a few more intense contractions with my mom. I seemed to be having a bit of back labour - feeling searing pain all through my lower back and hips, and my mom knew exactly where to put the pressure to ease the discomfort. She suggested I get into the shower and have the water run over my lower back to ease the pain. By the time I got into the shower, I knew immediately I did NOT want to be in there – contracting in such a restricting and uncomfortable space. My mom helped me back out of the shower and back into my nightgown. Tracy suggested it would take at least an hour to fill the birth pool and we should get on that! So Billy and mom started to prepare it while I tried to get our box of birth supplies from the nursery. I got as far as our hallway before dropping everything on the floor and labouring through a rough contraction on my hands and knees. I decided to go lay on my bed for a bit. Tracy got a cold pack for my forehead and used a hand fan to cool me down through the next few contractions. At about quarter to five our midwife Janice showed up and asked if we could do a quick exam to see where I was at. She took my blood pressure (90 over 60) and then asked me to go pee before she did the internal check. I got to the bathroom with some help from my mom and as I was wiping I pulled out a huge handful of bloody mucus. I remember grabbing onto my mom and proclaiming “Mommy, I’m scared.” (I think I called her “mommy” several times over the course of the day). Looking into her face as she told me not to worry – that it was all normal – calmed my fears. All of a sudden I felt an extreme sense of panic and had an incredibly overwhelming urge to push! I yelled “I’m pushing!” and everyone started crying out, telling me not to push – while Janice quickly did an internal while I was on the toilet and proclaimed me to be “Fully dilated with the bag bulging!” and asked me to get back to bed and onto my side. I have no idea how I got back to the bed – but I know my mom helped me and got me into a side-laying position. I don’t even think I had a second to lift my upper leg and seriously – with little to no effort on my part – out popped a baby! I didn’t even have to push on my own! In a gush of waters (which finally broke as she was emerging) Keara’s head came out, followed by one shoulder and then her arm and – there she was! My fantastic husband caught his daughter before the midwife even had a chance to put on her gloves! He placed her on my chest immediately. My mom cut the umbilical cord after a planned delay and Billy later shortened it to the clamp length. Keara barely made a sound – calm and alert and enjoying her fast and peaceful entry into our world. Keara Lyn (named after my maiden name “Kear” and “Lyn” taken from my first name Melynda) weighed 7 pounds 9 ounces, was 19.5” long and had a full head of dark brown hair. She was a vibrant pink colour from both her fast delivery and delayed cord clamping – and, if I may say so myself, perfect – in every way. Our home birth experience was not quite what I had imagined. I imagined a leisurely evening labouring in the pool with candles (I bought special tea light holders and candles just for this day. I had even bought special massage oil and labour mist to use during which I had imagined would be a long and arduous labour!) It turned out to be such a whirlwind I didn’t even have time to miss the things we didn’t do. My midwife even used the term “precipitous labour” when they called in the birth to the hospital – something I didn’t think I would ever experience after the 24 hour induced labour with my older son. Shortly after she was born, my dad showed up with Merrick to meet his new baby sister. Billy picked him up and they lay down on our bed and Merrick caught the first few glimpses of the tiny pink bundle he was destined to love forever. Capturing that moment on film (although slightly blurry) is one of the highlights of our whole homebirth experience. An hour and a half after the birth, I was up having a shower (with my mom as spotter) with no tearing that required stitches. I got dressed in a fresh nightgown and climbed back into bed (fresh sheets and blankets!) with our new daughter. Tracy put in a load of laundry and brought me a muffin while I breastfed Keara. Having my mom as part of our labour was, again, amazing. After having her attend Merrick’s birth two years ago, I could not imagine going through another labour and delivery without her. She clearly has been there before and knew all of the things to say and do to make me feel like I was doing everything right. She and Billy are the perfect labour team and I know they made all of the difference in making our birth experience even more special. Although not what we anticipated, Keara’s labour and delivery was an amazing experience - and the complete euphoria I experienced after giving birth drug free in our own bedroom will undoubtedly remain unmatched by future experiences. Keara is now a healthy and happy 8 month old. We have been exclusively breastfeeding with amazing success and recently started the “baby-led weaning” process of introducing solids. Life with two kids has its challenges, but there isn’t a day that goes by that both Billy and I don’t feel incredibly blessed and grateful for our beautiful family. Reading this birth story gave me chills. I loved it! I also had a long hospital induction in which I reluctantly consented to an epidural. I am hoping to have a lovely home birth story of my own in a few years (whenever God blesses us with a second child). Thank you for sharing. ~tears~ What a BEAUTIFUL birth story. I was truly moved when you said "I'm scared Mommy". I'm sure having your mom there to ease those fears was incredible (it was for me having my mom at my birth). What a magical moment before having another child and expanding your own role as a mother. While this birth isn't what you had expected, I see it as perfect and I'm inspired by it. Thank you for sharing!! !